My, my! The bitcoin is one fickle cryptocurrency, isn’t it? If you need a lil’ help getting up to speed with its price action, here’s a quick recap of the events that influenced bitcoin prices lately. As you can see from the chart below, bitcoin price action started picking up in October last year when BTC China announced its $5 million investment in the bitcoin market. Since then, traders and regulatory officials started buzzing about the cryptocurrency, with some highlighting its benefits and others remaining skeptical about its legitimacy. Bitcoin prices surged in November 2013 when U.S. state agencies and the Senate confirmed the legitimacy of the currency, eventually pushing prices past the $1,100 barrier on several exchanges. However, the rally came to a halt when BTC China decided to close shop as government officials began cracking down bank accounts related to bitcoin operations. The reopening of BTC China in January this year triggered a strong bounce for bitcoin prices. Another selloff ensued a few weeks back when Mt. Gox, the world’s largest bitcoin exchange, suspended trading due to a hacking allegation. It announced that it lost roughly 750,000 bitcoins and eventually filed for bankruptcy protection last Friday. Despite this setback and Apple’s decision to ban Blockchain on the App Store, several brokers are still offering bitcoin trading on their platforms, as many believe that there is hope for the cryptocurrency. A quick look at the chart reveals that bitcoin lost around 50% of its value, but this isn’t so shocking given the currency’s volatile nature. In addition, it appears that bitcoin updates from China have a strong tendency to move prices around. 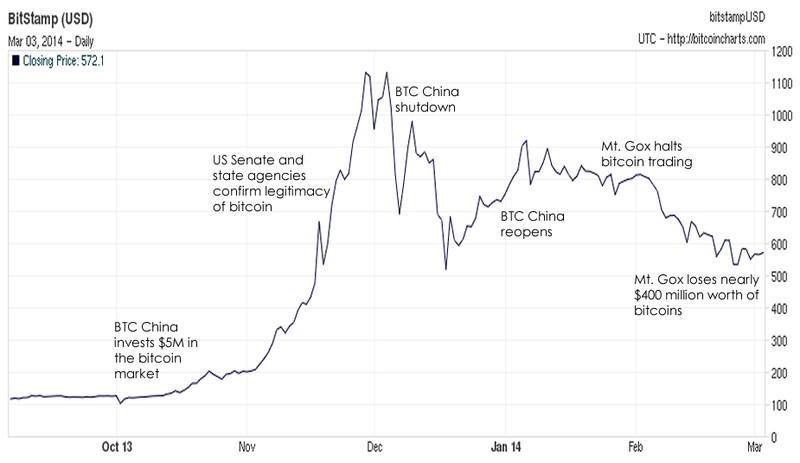 Bitcoin enthusiasts have noted that, once the panic-selling sparked by the Mt. Gox shutdown boils over, the currency can draw support from the fact that Chinese investors are taking advantage of the bargain bitcoin prices. In fact, bitcoin trading volume has quadrupled in the country, with approximately 30,000 bitcoins being actively traded since last week. Do you think BTC will trade at the $1,000 levels again soon? Let us know by voting through the poll below!